You must kill the captain of the pirate vessel Marie Elena. Speak with Vicente Valtieri for your first contract. Go to the Waterfront District and sneak onto the Marie Elena. Make your way up to the Captain's Cabin. Once the Captain is dead, dispatch or flee from the ship's pirates. Return to Vicente and receive your reward, the Black Band. The mini-quest to get the contract from Vicente Valtieri is called "Welcome to the Family". To complete it, you just need to accept the contract from Vicente. He will tell you that the target of your first contract is Gaston Tussaud, the captain of the pirate vessel Marie Elena. The captain's ship is currently docked in the Imperial City Waterfront District. You now have your shrouded armor, which is very helpful for this mission. In fact, it is possible to kill only the target in this mission. 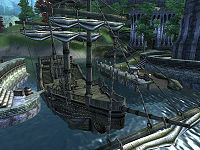 First, when you arrive, you will no doubt notice the pirates loading crates into the ship, overseen by a female Dunmer. If you so much as step on the ship and they see you, they attack. There are a few different strategies which result in a smoother and subtler entry. You can sneak down to the crates; once near, a prompt should pop up asking you if you want to hide away. Accept and you'll find yourself inside the ship. Sneak along the hallways until you hear two pirates speaking to one another. After they are finished with their conversation, move out of the way so they don't see you. After it's safe again, resume moving forward until you arrive at a ladder leading upwards. Climb and you'll be in the captain's cabin. Kill him any way you choose. Alternatively, you can wait until nightfall and jump onto the balcony at the back of the ship, though the lock is Very Hard (Teinaava hinted at this strategy if you asked him about the assignment beforehand). Tussaud will either be sleeping in his bed or eating dinner in the chair directly in front of you, an ideal target for a sneak attack. Although you will not be able to kill him instantly unless you have extremely high Strength/Blade or a custom weapon, you should be able to finish him off before he has a chance to counterattack. After looting his corpse and chest, leave the way you came in and either dive into the water or Fast Travel to get away unnoticed. Shortly after you kill the captain, two pirates will barge in to investigate the commotion, so you need to hurry. They will knock on the door shortly before busting it open, so if you're into looting the place, that's your only warning. If the Captain was sleeping, pickpocket his key so you can loot him and his treasure chest prior to his murder, since the two pirates waste no time in coming through the door. It is possible to sneak attack the two pirates if you hide in the shadowy nook next to the door where they enter, or you could escape through the rear door. However you complete the job, when done return to Vicente for the Black Band, a leveled ring that increases your Light Armor, Security, and Magic Resistance. There are many ways to kill Captain Gaston Tussaud, and sneak is not required at all. Guards: If you board the Marie Elena then the pirates will become hostile. However, they are quickly cut down by any Imperial Guards patrolling nearby. Once they are dead, you can proceed directly to the Captain's room unhindered. After you kill him, you can lead the pirates that come in to investigate outside, and the guards will take care of them as well. You can also lure the Captain to the Imperial Guards on the pier and he will be promptly slain. The silent killer method: Purchase a poisoned apple from M'raaj-Dar in the Dark Brotherhood Sanctuary. Leap onto the balcony at the stern of the ship (back end for you land-lubbers) and unlock the door. If you do this at around 1am, the captain will be asleep. Reverse pickpocket the captain and place a poisoned apple into his inventory. Remove all food from the table and any containers in the captain's stateroom. Leave. When the captain wakes up and eats, he will eat the poisoned apple - killing him. The guards aren't alerted by using this method. In fact, nobody is. You can re-enter the stateroom after he's dead and clean him out of everything if you didn't loot before when you were placing the apple. Sniper: Another stealthy method is to sneak to the ship and shoot down the pirates and the first mate. Then you can enter the Captain's cabin, preferably when he's sleeping, and fire away. Remember, the two pirates who check on their Captain will still come, so get out of there as soon as possible. You can escape easily by stealing the Captain's Key and slipping out of the back door, onto the balcony, and off the ship. If you approach the Captain while he is sleeping, it is possible to pickpocket his sword from him, forcing him to fight unarmed. This can be useful if you are having difficulty fighting him. Taking items from the crates and barrels lined up by the Marie Elena will cause the pirates to accuse you of theft, although they will take no action against you. Sneaking into the ship using the crate method takes much longer, and merits no bonus. It isn't considered a crime to enter the captain's cabin directly. You cannot kill the captain or smuggle yourself on board the ship until you have picked up the quest. The captain will not be present beforehand and activating the crates just gives you the typical loot screen. Any pirate you do not kill, will, upon completion of this quest, remain looking for you in the Waterfront District in order to kill you. This quest will be easier if you do it during the Waterfront invasion portion of Misdirection since there are more guards around than usual to attack the pirates. You can permanently lose your current horse, whether owned or stolen, during this quest. If you choose to get on board the ship by hiding inside the crate on the dock, and if you are riding a horse when you accept the "hide in crate" option, both you and your horse will be loaded into the ship's cargo hold. This dooms the horse to be trapped within the ship forever. The horse cannot be rescued using fast travel, even after you have left the ship, and will remain even after a cell reset. You can rescue the horse with the console command movetoqt which moves you and your horse to your current quest target. Another way of rescuing your horse is to use the console command player.coc (insert target code here). A third method is to open the command console, click the horse, close console, and once outside re-open the console and type moveto player. The horse should appear at your location. If you choose to enter the ship by using the crate, the pirates having a conversation may not move once they finish this conversation. ? Valtieri may not offer you the contract option in dialogue. ? 10 I must accept a contract from Vicente Valtieri. 100 Finishes quest I have accepted a contract from Vicente Valtieri. 10 I must go to the Waterfront District in the Imperial City and gain access to the pirate ship Marie Elena, so I can kill Captain Gaston Tussaud. I may be able to smuggle myself onboard with the cargo, in one of the packing crates. 25 Just as expected, the crate I hid in has been transported to the ship's hold. I must now find and kill the Captain, Gaston Tussaud. He's probably in his cabin, at the rear of the ship, on a higher deck. 26 I have gained access to the Captain's cabin of the ship Marie Elena. I must now kill Gaston Tussaud. 30 Gaston Tussaud is dead. I must now return to the Sanctuary and speak with Vicente Valtieri to receive my reward. 100 Finishes quest I have spoken with Vicente Valtieri. It is possible to use the console to advance through the quest by entering setstage Dark02Watery stage, where stage is the number of the stage you wish to complete. It is not possible to un-complete (i.e. go back) quest stages. See SetStage for more information. Esta página foi modificada pela última vez à(s) 21h17min de 22 de dezembro de 2015.